On January 15, 2014, UFA hosted a special event in Foremost, Alta. to honour the second-round winners, the Foremost Minor Hockey, Foremost Seniors and Legacy Bridge Committee. At the event, representatives from Foremost were asked to choose one of five semi-finalists to receive the third $50,000 prize. Spruce View Agricultural Society has been named the third $50,000 prize winner in UFA's Rural from the Roots Up - Get 'n' Give Contest. 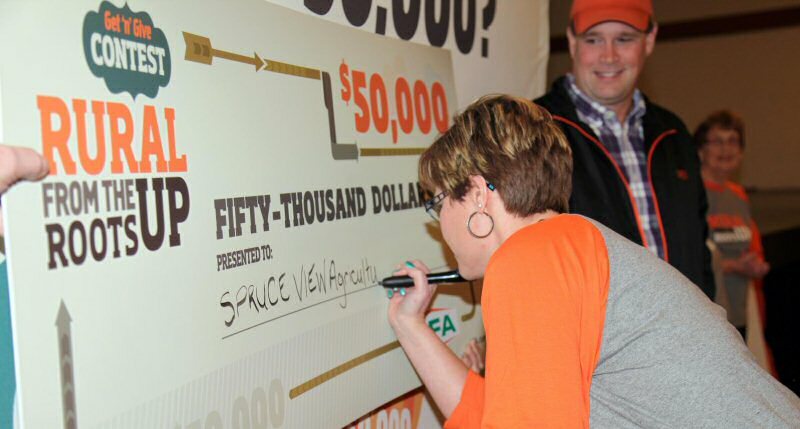 Spruce View Agricultural Society was selected as the third $50,000 prize winner in UFA's Rural from the Roots Up - Get 'n' Give Contest. "They had a creative song with original lyrics, and 'Captain UFA' really made them stand out," said Lylla Laqua, Foremost Seniors Member. The community will use the prize money to make major repairs to the unsafe roof and fix the ventilation system at the Diamond Jubilee Recreation Centre. "We came to a unanimous decision because we all felt the same way. The prize would allow for their facility to benefit for many generations to come in Spruce View," said Stacey Barrows, Foremost Minor Hockey Member. UFA Co-operative Limited is one of Alberta's most dynamic enterprises. UFA has an unmatched network of more than 110 bulk fuel and cardlock Petroleum locations, 35 Farm & Ranch Supply stores and 12 Wholesale Sports Outdoor Outfitter stores. Our employees and independent Petroleum agents strive to provide products, services and solutions to farmers, ranchers, members and commercial customers in Alberta, British Columbia and Saskatchewan. Since founding in 1909, UFA has grown from a small-scale local co-operative into a comprehensive enterprise with $2.1 billion in annual sales and over 120,000 members. While UFA has grown and changed over the years, at our heart remains a commitment to agriculture and to the communities we serve.